A tazza, a saucerlike bowl on a high stem, is constructed on a blowpipe. 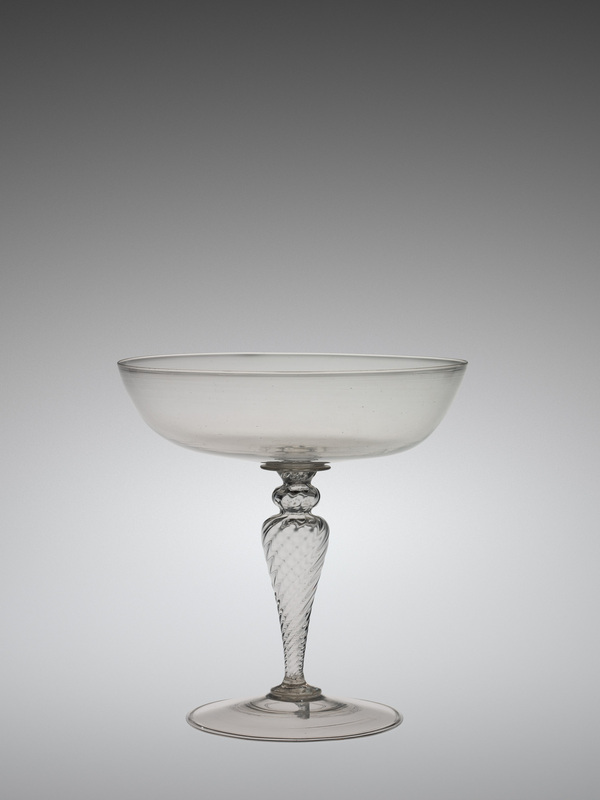 The bowl and foot of the object are unfluted glass, and the stem is made by dip molding and twisted to create fluting. The stem has two constrictions. Two mereses are shown. The foot has a folded edge, and the bowl is opened with parchoffi (wooden jacks). This is a vessel built on the blowpipe. The first gather of glass will become the bowl or top of the goblet. The glass is rolled back and forth on the metal table called the marver, and this makes the glass perfectly concentric with the blowpipe. The gather also elongates somewhat. Air is blown into the pipe, and a bubble forms. The tip of the gather is lightly marvered to make it pointed and to cool the glass. After reheating the glass, the process of shaping the bowl begins. The rubber tube allows air to be blown into the pipe while the working takes place. A constriction is formed between the bubble and the blowpipe, and this will allow it to be broken free later in the process. A small gather of glass is added to the tip of the bowl, cast free of its gathering rod, and tooled to become a merese. The tip of the merese is left slightly conical. This will make centering the stem a little easier. The stem begins as a gather of glass made on another blowpipe. The glass is inflated, the bubble elongated somewhat, and then lowered into a dip mold (or optic mold). This creates ribs. A broad constriction is made between the bubble and the blowpipe. The tip of the bubble is carefully centered onto the tip of the merese. The first blowpipe is turned, and the rib pattern twists. The stem is cut free of its blowpipe. 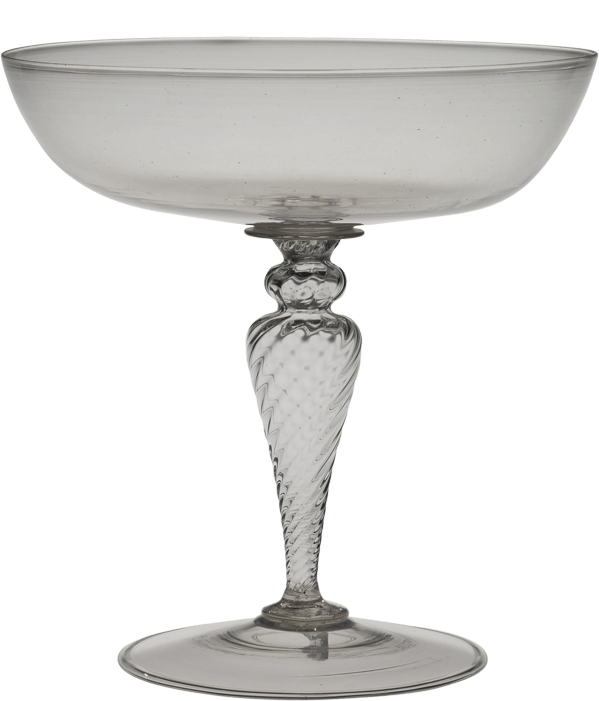 A decorative constriction is made, and the excess glass at the end of the stem trimmed free. A second merese is made on the end of the stem. This is pushed upward onto the stem to create a very strong join. A third bubble is lowered onto the surface of the merese. This will become the foot. A constriction is made, and the excess glass is broken free, thus leaving a hole at the end of the bubble. After reheating, the jacks and the soffietta are used to create the final shape of the foot. The soffietta is used to cool the lower part of the stem, which unavoidably gets soft during the reheating of the foot bubble. This vessel has a foot with a folded edge. And after a last reheat, the foot is given its final shape. The edge is made flat, and the site where the punty will be attached is cooled slightly. The transfer to the punty takes place. The neck is broken. The edge of the original object is exceedingly thin. A special lip-thinning procedure is used. A flare is made, a constriction is made, and the thick glass pulled thin. Excess glass is trimmed free beyond the constriction. After reheating, the final opening process begins. The hole is opened to a diameter of about two inches. The glass is very thin, and it requires frequent reheating. The soffietta is used to inflate the shoulder and to make the sphere even more oblate. The hole is made large enough for the wood jacks (or parcioffi) to fit in, and near the base, the diameter is increased gradually. A combination of the thin glass and the wet, cold parcioffi blades requires frequent reheating. Gradually, as the base diameter increases, the height of the bowl decreases, creating the characteristic shape. The finished vessel is flashed in the furnace and broken free of its punty and placed in the annealing oven for gradual cooling.